The Federal Reserve will end its stimulus programme in October if US economic growth continues at its current pace, according to minutes from its June meeting. The Fed has been buying bonds to lower long-term interest rates and boost growth since September 2012. 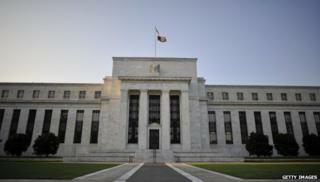 A end to stimulus efforts indicates the Fed believes the US economy can continue to grow without its support. Currently, the bank is buying $35bn (£20bn) of bonds monthly. That is down from a high of $85bn in January, when the US central bank first began trimming its monthly bond purchases by $10bn a month. The minutes from the 17-18 June meeting of the Federal Open Market Committee (FOMC) revealed that the central bankers planned to continue their $10bn cuts until one final $15bn trim in October. "If the economy progresses about as the Committee expects...this final reduction would occur following the October meeting," the minutes said. US markets - which had been trading up for the day - shed a few points in the wake of the announcement, which many investors and analysts had long been expecting. Investors had been unsure about the pace of the Fed's cuts, and had put the end of the stimulus programme at either October or mid-December. By naming an exact date, the Fed has attempted to relieve that uncertainty. Now, the speculation on Wall Street will be when the central bank will raise its short-term interest rate - known as the federal funds rate - which has been at 0% since the 2008 financial crisis, when it slashed rates to boost growth. Critics of the bond-buying stimulus programme - which is known as "quantitative easing - have argued that by keeping rates extremely low for a long period of time, the Fed has forced investors into riskier areas like stocks or corporate debt. That has led to fears of a bubble, as the Dow Jones Industrial Average topped 17,000 points for the first time last week. However, Federal Reserve chair Janet Yellen recently sought to allay fears about increased risk in the financial sector. In a speech last week in front of the International Monetary Fund, Ms Yellen said that while she did "see pockets of increased risk-taking across the financial system", the Fed still had many tools at its disposal to act should certain sectors begin to overheat.